Your child is feverish and achy. Or maybe your baby just had his shots and seems uncomfortable. Of course you want to make your child feel better. So you reach for the acetaminophen to provide some relief. That's okay, right? Not necessarily. While the drug is safe if taken as directed, too much of it can cause serious problems - even liver damage and death. And with so many different formulas available, including very concentrated drops for infants, it's easier than ever to have an accidental overdose. 1. Always read labels. Don't just check the dose. Also make sure you're giving the right type of medicine to your child. Overdose can occur if you accidentally give an older child a teaspoon or two of concentrated infant drops. These drops contain more medicine in a smaller amount of liquid. Never give a child a dose more than every four hours, and never give more than the dose listed for your child's age or weight. Call your baby's doctor if you are not sure what he weighs. 2. Use the right tool for dosing. Most liquid medicines come with their own measuring cup or dropper. Make sure you use these for the most accurate dose. An oral syringe is more accurate than a measuring spoon. Ask your pharmacist for one if you don't have one at home. He or she may be able to give you one for free. Never use a household teaspoon, as these can vary greatly in size. 3. Don't combine medicines. Avoid giving two types of pain relief or fever reducer to treat symptoms, unless your doctor tells you to. Make sure you aren't giving your child other medicines, such as combination cough, cold and flu medicines. These may also contain acetaminophen. 4. Medicate your child only when needed. Never give children medicine in the hopes of making them sleepy. Ask your doctor about how you should treat a mild fever. He or she might suggest other ways to soothe your child first, such as tepid baths, cool compresses and cold beverages. Never put alcohol in the bath. 5. Know the signs of critical liver problems. Symptoms of liver damage can start with seemingly mild symptoms, such as decreased appetite, nausea and vomiting. Call your child's doctor if he develops these symptoms after taking acetaminophen. More serious signs of advanced liver damage are fatigue, yellowing of the skin (jaundice), confusion and tenderness around the abdomen. In 2008, a large study in the journal Lancet also found that using acetaminophen in a child's first year of life is linked to a greater risk of asthma and eczema later in childhood. Doctors are still looking into this connection. In late March and early April 2009, cases of human infection with swine influenza A (H1N1) viruses were first reported in Southern California and near San Antonio, Texas. Other U.S. states have reported cases of swine flu infection in humans and cases have been reported internationally as well. An updated case count of confirmed swine flu infections in the United States is kept at http://www.cdc.gov/swineflu/investigation.htm CDC and local and state health agencies are working together to investigate this situation. A health official in indonesia reported yesterday that a hospitalised woman was tested positive for bird flu. indonesia has witnessed 52 deaths due to bird flu//, the number being the highest of any country. Most of the deaths occurred from the beginning of this year. "A 67-year-old woman living in the Cisarua area of Bandung had contact with fowl," the official from the bird flu information centre over telephone. "The woman was admitted to the hospital on Oct. 7 and was still alive, " the official added. "The woman tested positive to the H5N1 virus after a test at a health ministry laboratory and one conducted by NAMRU, the U.S. Naval Medical Research Unit based in Jakarta," the official added. Hadi Yusuf, the director of the Hasan Sadikin hospital in Bandung, southeast of the capital Jakarta, said, "The woman is being treated with the anti-viral drug Tamiflu and antibiotics. "Her condition is bad. For a second day, she has been on a respirator and her blood pressure is high." Yusuf said, "The woman had come down with a fever two weeks after being in the vicinity of dead chickens. " The indonesian government has not taken up mass culling of birds, in spite of the rise in the number of human deaths, mentioning the costs and uselessness in a big, densely populated country where a few fowls in the back yard is common. Feeling run down? Try laughing more. Some researchers think laughter just might be the best medicine, helping you feel better and putting that spring back in your step. "I believe that if people can get more laughter in their lives, they are a lot better off," says Steve Wilson, M.A., CSP, a psychologist and laugh therapist. "They might be healthier, too." "The definitive research into the potential health benefits of laughter just hasn’t been done yet," says Robert R. Provine, professor of psychology and neuroscience at the University of Maryland, Baltimore County and author of Laughter: A Scientific Investigation. People who believe in the benefits of laughter say it can be like a mild workout — and may offer some of the same advantages as a workout. One pioneer in laughter research, William Fry, claimed it took 10 minutes on a rowing machine for his heart rate to reach the level it would after just one minute of hearty laughter. While the results are intriguing, don’t be too hasty in ditching that treadmill. One piece of chocolate has about 50 calories; at the rate of 50 calories per hour, losing one pound would require about 12 hours of concentrated laughter! Relaxation and sleep. The focus on the benefits of laughter really began with Norman Cousins' memoir, Anatomy of an Illness. Cousins, who was diagnosed with ankylosing spondylitis, a painful spine condition, found that a diet of comedies, like Marx Brothers films and episodes of Candid Camera, helped him feel better. He said that 10 minutes of laughter allowed him two hours of pain-free sleep. The Evidence: Is Laughter the Best Medicine? But things get murky when researchers try to sort out the full effects of laughter on our minds and bodies. Is laughter really good for you? Can it actually boost your energy? Not everyone is convinced. "I don't mean to sound like a curmudgeon," says Provine, "but the evidence that laughter has health benefits is iffy at best." He says that most studies of laughter have been small and not well conducted. He also says too many researchers have an obvious bias: they go into the study wanting to prove that laughter has benefits. For instance, Provine says studies of laughing have often not looked at the effects of other, similar activities. "It's not really clear that the effects of laughing are distinct from screaming," Provine says. Provine says that the most convincing health benefit he's seen from laughter is its ability to dull pain. Numerous studies of people in pain or discomfort have found that when they laugh they report that their pain doesn't bother them as much. But Provine believes it's not clear that comedy is necessarily better than another distraction. "It could be that a compelling drama would have the same effect." One of the biggest problems with laughter research is that it's very difficult to determine cause and effect. For instance, a study might show that people who laugh more are less likely to be sick. But that might be because people who are healthy have more to laugh about. Or researchers might find that, among a group of people with the same disease, people who laugh more have more energy. But that could be because the people who laugh more have a personality that allows them to cope better. So it becomes very hard to say if laughter is actually an agent of change — or just a sign of a person's underlying condition. In his own research, Provine has found that we're 30 times more likely to laugh when we’re with other people than when we're alone. People who laugh a lot may just have a strong connection to the people around them. That in itself might have health benefits. Wilson agrees there are limits to what we know about laughter's benefits. "Laughing more could make you healthier, but we don't know," he tells WebMD. "I certainly wouldn't want people to start laughing more just to avoid dying — because sooner or later, they'll be disappointed." But we all know that laughing, being with friends and family, and being happy can make us feel better and give us a boost — even though studies may not show why. So Wilson and Provine agree that regardless of whether laughter actually improves your health or boosts your energy, it undeniably improves your quality of life. "Obviously, I'm not anti-laughter," says Provine. "I'm just saying that if we enjoy laughing, isn't that reason enough to laugh? Do you really need a prescription?" SOURCES: Steve Wilson, M.A., CSP, psychologist, Columbus Ohio; board member of the American Association for Therapeutic Humor, Columbus, Ohio. Robert R. Provine, professor of psychology and neuroscience, University of Maryland, Baltimore County; author, Laughter: A Scientific Investigation. Association for Applied and Therapeutic Humor Web site: "The Humor Connection." Gervais M. and Wilson D.S. Quarterly Review of Biology, December, 2005. Hayashi K et al, Diabetes Care, May 2003. Panksepp J. Psychological Science, December 2000. Rosner F. Cancer Investigation, 2002. University of Maryland School of Medicine, news release: "University Of Maryland School Of Medicine Study Shows Laughter Helps Blood Vessels Function Better." Surprisingly, more and more people are starting to drink raw, unpasteurized cow's milk. Or maybe that shouldn't be too surprising as most people associate things that are raw or natural as being safer and healthier for them. Just as you would have thought, raw milk is basically "straight from the cow," and hasn't been processed or pasteurized. Although most experts consider pasteurization to be one of the most important health advances of the last century, some people think that it removes nutrients and kills beneficial bacteria. They also claim that raw milk can taste better than pasteurized milk. Is raw milk healthier than pasteurized milk? There is no research to support that raw milk is healthier or, according to the FDA, that there is a "meaningful difference between the nutrient content of pasteurized and unpasteurized milk." Since young children are at big risk for getting sick from any bacteria that may be in raw milk and they need vitamin D, it is important that you not give your child raw, unpasteurized cow's milk. In fact, the American Academy of Pediatrics states that "children should not consume unpasteurized milk or products made from unpasteurized milk, such as cheese and butter, from species including cows, sheep, and goats." You can give your three year old homogenized whole cow's milk, but remember that the American Academy of Pediatrics recommends that you begin to use 2%, low fat, or skim milk once your child is 2 years old. So you might make the switch to low fat milk if you haven't already. Your child's diet should now resemble that of the rest of the families, with 3 meals and 2 snacks each day. You should limit milk and dairy products to about 16 to 24oz each day, and juice to 4 to 6oz each day, and offer a variety of foods to encourage good eating habits later. To prevent feeding problems, teach your child to feed himself as early as possible, provide him with healthy choices and allow experimentation. Mealtimes should be enjoyable and pleasant and not a source of struggle. Common mistakes are allowing your child to drink too much milk or juice so that he isn't hungry for solids, forcing your child to eat when he isn't hungry, or forcing him to eat foods that he doesn't want. Your child may now start to refuse to eat some foods, become a very picky eater or even go on binges where he will only want to eat a certain food. An important way that children learn to be independent is through establishing independence about feeding. Even though your child may not be eating as well rounded a diet as you would like, as long as your child is growing normally and has a normal energy level, there is probably little to worry about. Remember that this is a period in his development where he is not growing very fast and doesn't need a lot of calories. Also, most children do not eat a balanced diet each and every day, but over the course of a week or so, their diet will usually be well balanced. You can consider giving your child a daily vitamin if you think he is not eating well, although most children don't need them. While you should provide three well-balanced meals each day, it is important to keep in mind that most children will only eat one or two full meals each day. If you child has had a good breakfast and lunch, then it is okay that he doesn't want to eat much at dinner. Other ways to prevent feeding problems are to not use food as a bribe or reward for desired behaviors, avoid punishing your child for not eating well, limit mealtime conversation to positive and pleasant topics, avoid discussing or commenting on your child's poor eating habits while at the table, limit eating and drinking to the table or high chair, and limit snacks to two nutritious snacks each day. To avoid having to supplement with fluoride, use fluoridated tap water. If you are using bottled or filtered water only, then your child may need fluoride supplements (check with the manufacturer for your water's fluoride levels). Feeding practices to avoid are continuing to use a bottle, giving large amounts of sweet deserts, soft drinks, fruit-flavored drinks, sugarcoated cereals, chips or candy, as they have little nutritional value. Also avoid giving foods that your child can choke on, such as raw carrots, peanuts, whole grapes, tough meats, popcorn, chewing gum or hard candy. Several years ago,,, my Dad's had a job vacation from his work from outside country,,, At the time I haven't born yet,,, neither he knew my Mom yet... I think it took couples years later untill they actually known each other... (I've got this information of course from my Dad,,, he usualy tell me many thing,,, even I really don't know what really happened of his stories are,,). After years ahead,,,, my cousins grow up,,, and he gave me his autoped....Now,, I've got an autoped. What a autoped. What Can Medications Do To Help Control My Headaches? been effective for years and is an option for those who don’t tolerate Triptan family abortive drugs. Drug interactions are an issue with this one. RESCUE MEDICATIONS are used when the initial abortive treatment didn’t work or was taken too late in the headache process to be effective. The goal when using these drugs is to provide relief from pain with the risk of sedation and/or gastrointestinal side effects being an acceptable trade-off. Tramadol (Ultram) is a good option. Commonly, oral opiods like Codeine (Tylenol#3), and propoxyphene (Darvocet), hydrocodone (Lortab, Vicodin) or oxycodone (Percocet) are used. Over-use of these drugs can lead to rebound headaches and risk of addiction. Injectable opiods like meperidine (Demerol) are sometimes used in the emergency room. Opiods should NEVER be used as the only drug to treat regular migraine. In this authors’ opinion, butalbital containing drugs (Bupap, Fiorinal, Fioricet) should never be used because of addiction and rebound headache concerns. In fact, it is banned in Europe. Imitrex can be injected and is the only drug in its class indicated for migraine of several hours to days duration. Anti-emetics (Phenergan and Compazine) and anticonvulsants (Depakote) are sometimes used in the emergency room setting as rescue, but are not practical for regular home use due to marked sedation, adverse event risk or need for IV administration. PREVENTIVE MEDICATIONS are those taken daily and long-term. Usually it takes 1-3 months to see benefit. Some frequent headache sufferers have taken these for years. The goal when using these drugs is to reduce headache frequency and/or intensity. They are indicated for patients suffering few disabling headaches a month, or person suffering frequent headaches that affect daily performance and quality of life. Anticonvulsant medications like Depakote, Topamax, Neurontin, and Zonegran are now used to great success for migraine. Low doses of older anti depressants like amitriptyline (Elavil) and nortriptyline (Pamelor) are very good for migraine and tension headache. Depression or anxiety often co-exist in the headache sufferer and recent SSRIs (Lexapro, Paxil, Prozac, Zoloft, etc.) or similar acting ones like, Effexor XR and Wellbutrin XR, are helpful in co-existing conditions. Beta-blockers, like propranolol (Inderal), and tenormin (Atenolol), help many with migraine. Sometimes muscle relaxants like Tizanidine (Zanaflex) are taken in a preventive fashion for tension headaches as well. Preventives are combined for some headache patients. Hormones such as Mircette and Seasonale contraceptive pills are used in some menstrual migraine patients. A STATEMENT OF CAUTION. It is critical to note that overuse of pain medication can actually result in more frequent headache, a phenomenon called analgesic rebound headaches. Most neurologists believe use of OTC medications that contain caffeine in combination with aspirin, acetaminophen, and/or ibuprophen (Excedrine, Excedrine Migraine, Anacin, BC Powders, Goody Powders), Midrin, all butalbital products, all Triptans, and all opiods used on more than 2 occasions a week can put a person at risk for rebound headaches. Your healthcare provider should instruct you on their appropriate use and recommend preventive medications if you are at risk. Thus headache prevention is a critical component of care. There are ALTERNATIVE METHODS that are helpful. Some are more effective than others in relieving headaches. Over-the-counter pain rubs like Arthrocreme and Ben Gay (or generic rubs with 10-30% salicylate), Blue Emu, or Blue Ice Gel (menthol) are effective as an adjunct or alone for tension headache. Rub them on the neck. Biofreeze gel and Head-On sticks are very helpful for daily pain of tension headache and mild to moderate migraine pain. They are good adjuncts/alternatives to OTC medicines if rubbed on the forehead as needed. Microwaveable heat pads (gel-packs or gel neck wraps) are excellent for long periods of studying, computer work, and lab work. Hot tub or whirlpool massage to theneck and shoulders help many. Vitamins and herbal supplements that have good data to support their use in migraine prevention include vitamin B2, magnesium, and feverfew (Go to ww.migrelief.com to order a product called Migrelief containing all 3 at recommended doses). Co-enzyme Q10 has been shown in a few studies to be helpful in reducing migraine frequency. These need to be taken in regular daily doses to be beneficial. Omega- 3 and Omega-6 fatty acids (in fish oil and flaxseed oil) may also be of benefit and are being studied. headache patients with variable degrees of success. Some headache sufferers are relieved by just a single medication occasionally. Others may require all manner of medications and modalities to manage difficult headache patterns. Most satisfied headache patients find that using a combination of lifestyle modification, OTC and/or prescription medications, and even alternative medicine products and modalities help manage their headaches. The key to controlling headaches is to educate yourself about migraine and create your own “headache toolkit” with the help of your healthcare provider. Medication use whether OTC or prescription should be stratified based on the severity of pain and disability, rate of intensification of pain, and duration of headache. Simply put, use well tolerated, cheap, and usually effective medications (e.g. naprosyn, caffeine, acetaminophen) for mild pain, and more potent, more costly, and clinically reliable prescription medications (e.g. Triptans drugs, Midrin) for moderate to severe pain. In time, you will determine what quality of headache will require which Medication. How Do I Start Taking Control of My Headaches? Inquire about preventive medications and supplements. Take these medications regularly, as directed. Go to www.headache.org or other similar websites and educate yourself on headache. The better you understand them the better you will be able to help yourself and your healthcare provider regarding treatment and prevention. Read Headache Help, 2nd edition, Houghton and Mifflin and/or Heal Your Headache, David Buchholz, MD, Workman Publishing, 2002. These are just 2 of many good books out there on the subject! scanner or MRI may be needed. These are “secondary” causes of headache. Typically, no scanning is warranted for uncomplicated migraine and tension headaches, as they are usually normal and are costly to the patient. About 95% of recurrent headaches are either migraine or tension headaches. Some people have both kinds. Some medical texts refer to this as “mixedheadache disorder.” For many years, these two headache types were thought to be independent disorders, but now many neurologists feel the mechanisms that cause both of them are similar and treatments for them overlap. Like two flavors of ice cream, migraine and tension headache lie on the same spectrum of headache. There are other notable forms of “primary” headache such as cluster headaches. These are fortunately uncommon and will not be discussed here. Most headaches can be diagnosed by your health care provider through a history of symptoms and a physical exam. Rarely, there may be a secondary cause of headache such as a tumor or blood vessel problem. In the event a rarer cause of headache is suspected, blood work, neurology referral, or even imaging by CT or MRI may be needed. Typically, no scanning is warranted for uncomplicated migraine and tension headaches, as they are usually normal and are costly to the patient. Usually have a pulsing or throbbing quality, but may be continual dull ache, or pressure. Some describe stabbing or sharp pains. Lengthy exposure to flickering lights, fluorescent lights, even bright sunlight, and computer screens Remember that any one trigger or the combined effects of several triggers may spawn a migraine. Due to similar mechanisms, tension headache may result from these too. The effects of triggers are cumulative each day or mount over time from regular exposure. Small doses of triggers are sometimes all it takes to cause a headache. Did you ever hear someone say, "I lost my voice"? Did you think: "What did you do with it?" Or maybe you woke up one morning and your voice sounded funny when you tried to talk. Maybe you were croaking like a frog or when you tried to speak, only some of the words came out. Here's the way your voice works — and why sometimes it doesn't. Open up your mouth and say something. Anything. Answer the question: "What's your favorite flavor of ice cream?" At the top of your windpipe — also called your trachea (say: tray-kee-uh) — is your larynx (say: lar-inks), or voice box. It's the source of your voice. Inside your larynx are two bands of muscles called vocal cords, or vocal folds. When you breathe, your vocal cords are relaxed and open so that you can get air into and out of your lungs. But when you decide to say something, these cords come together. Now the air from your lungs has to pass through a smaller space. This causes your vocal cords to vibrate. The sound from these vibrations goes up your throat and comes out your mouth as "Chocolate is the best flavor!" (or whatever your favorite flavor of ice cream happens to be). You can make different sounds by lengthening or shortening, or tensing or relaxing, the vocal cords. Although you don't even think about it, every time you want to talk with a deeper voice you lengthen and relax these vocal muscles. When you talk with a higher pitched voice, you tighten the vocal cords and make them smaller. You can try this right now. Make your voice go from deep to high pitch and back again. Do you feel the vibrations along your throat coming from your vocal cords? When your cords become inflamed and swollen, they can't work properly. Your voice may sound hoarse. This is called laryngitis (say: lar-un-jye-tus). 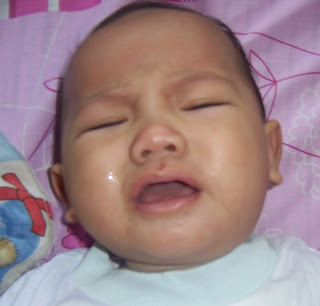 In kids, laryngitis often comes from too much yelling and screaming. You may be hollering at your younger brother or sister. Or you might be cheering on your favorite team, yelling with the crowd during a great play — touchdown! Or you may be in a group of noisy kids and have to talk loudly to be heard. Even a lot of loud singing can irritate your vocal cords and cause laryngitis. Although it sounds odd, sometimes your stomach can cause laryngitis. Just like you have a tube for air to go into and out of your lungs, you have a tube for food to go into your stomach. Sometimes the stomach acid that helps break down that food comes back up your swallowing tube. The acid can irritate your vocal cords. Allergies or smoking can also irritate your vocal cords (another good reason not to start messing with cigarettes). Did you ever notice that people who smoke a lot have rough, raspy voices? Infections from germs are a very common cause of laryngitis — in kids as well as adults. Sometimes bacteria can infect the vocal cords, but most of the time it's viruses — like those that cause runny noses or flu-like illnesses. That's why sometimes when you have a cold or a bad cough, your voice also sounds funny. Kids who yell and talk loudly can irritate their vocal cords. Over time, people who yell all the time may develop nodules, or little bumps, on their vocal cords. This can make your voice hoarse, rough, and deeper than usual. How Do I Know if I Have Laryngitis? A horsy or raspy voice is the main symptom or sign of laryngitis. You may also have no voice at all or maybe just little squeaks come out when you try to talk. You may need to cough to clear your throat, or you may feel a tickle deep in your throat. These are all signs that you may have laryngitis. You may have this strange voice for a few days, but if you have it longer, you probably will have to go to the doctor. How Will My Doctor Know I Have It? Most of the time, doctors can diagnose laryngitis just from the changes in your voice, and knowing that you've had a cold or have been yelling too much. But sometimes the doctor might think you need to see an ENT specialist – a doctor that specializes in diseases of the ears, nose, and throat. This doctor can look into your throat using a special mirror. The mirror is angled so that when the doctor puts it in your mouth, he or she can look down into your larynx. Sometimes doctors use a tiny tube with an even tinier camera that goes through your nose or mouth. This cool camera that goes into your throat is a little uncomfortable. Luckily, it only takes a minute for the doctor to take a good look at your vocal cords. How Will My Doctor Treat Laryngitis? How the doctor treats your laryngitis depends on why you have it. If the laryngitis is from a viral infection, the doctor will recommend lots of fluids and resting your voice by talking as little as possible. Being quiet can be hard, but it can be fun, too — especially if you get to show people what you're trying to say by drawing pictures or acting things out. If your laryngitis is from too much yelling, you will have to be more careful with your voice. Try not to yell at your brother, even if he drives you crazy! It's OK to cheer during the big game, but remember not to yell too loudly for too long. If stomach acid is causing your laryngitis, the doctor will talk to you about medication. You may have to change your diet and give up some foods that make the problem worse. To prevent laryngitis, try not to talk or yell in a way that hurts your voice. A humidifier that puts more water into the air may also help keep your throat from drying out. Also, never smoke and try not to be around people who are smoking. Tonight, when you open your mouth and say "good night," you'll know where the sound of those words come from. And, if that "good night" comes out like the "ribbit" of a frog, you'll know that it could be laryngitis! Mean while, I felt so tired at the time,,, and I've got sleep.... I didn't know when my Dad's arrived home. I just knew when I woke up several hours later. "My son,,, you've got very bad fever", my Dad's told me. I have to take medicine to reduce fever.. It wasn't good for me at the time,,cause I feel no good at all. Well,,, I've just a little kids,,, all I wanna do is playing all the time,,, It was true that I've got ill, but my Dad already home,,,so,,,I played with him. Laryngitis is usually caused by a virus or occurs in people who overuse their voice. Occasionally, you may develop laryngitis from bacterial infections and, rarely, from infections such as tuberculosis, syphilis, or a fungal infection. People with prolonged laryngitis should see their doctor to be checked for tumors, some of which may be cancerous. Smokers are especially at risk for cancer. Many times laryngitis may develop with, or a few days after, a sore throat. Murine typhus, also called fleaborne or endemic typhus, is a rickettsial disease caused by the organism Rickettsia typhi. Another organism, R. felis, may also play a role in causing murine typhus. Rickettsiae are a type of bacteria. Rats and their fleas are the natural reservoirs (animals that both maintain and transmit the disease organism) for murine typhus. Other animals, such as opossums and domestic cats, may also be involved in the transmission of murine typhus. Fleas, such as the rat flea, Xenopsylla cheopis, and the cat flea, Ctenocephalides felis, are the most common vectors (animals that transfer the disease from one host to another) of murine typhus. People get murine typhus from an infected flea. Most fleas defecate while biting; the feces of infected fleas contain the rickettsial organism. The rickettsiae enter the body through the bite wound or from a person scratching the bite area. It is possible to get murine typhus by inhaling contaminated, dried flea feces. However, this method of transmission is not as common as transmission from a biting flea. The incubation period for murine typhus is 6 to 14 days. Symptoms of the disease include headache, fever, nausea, and body aches. Five or six days after the initial symptoms, you may get a rash that starts on the trunk of your body and spreads to your arms and legs. If left untreated, the disease may last for several months. A doctor can conduct tests to tell you if you have murine typhus. What do I do if I get murine typhus? If you suspect that you have murine typhus, see a doctor as soon as possible. If you wait too long to see a doctor, you may have to be hospitalized. Murine typhus is easily treated with certain antibiotics. Once you recover, you will not get it again. What can I do to prevent murine typhus? Clean your yard so that rodents, opossums, and stray cats cannot live there. Remove any brush or trash, keep the grass mowed, and keep firewood off the ground. Do not leave pet food out at night as this attracts other animals. Prevent rodents from living in your house. Treat for fleas before you begin rodent control in your house or yard. Otherwise, when the rodents die, the fleas will search for new hosts, possibly you and your family. There are several commercial flea control products on the market. Pick one and follow the label instructions. If you own pets, control the fleas on them regularly. If they come in contact with infected fleas, they could bring them home to you. Ask a veterinarian about flea control products that are safe to use on your pets. Epidemic typhus results from infection by Rickettsia prowazekii, a Gram negative, obligate intracellular bacterium. At least two strains can be distinguished by genetic analysis. One strain is found only in humans; the other also occurs in flying squirrels in the United States. R. prowazekii has been found worldwide. Foci of disease currently exist in many countries in Asia, central and east Africa, and the mountainous regions of Mexico, Central and South America. War and famine can result in explosive outbreaks of disease. In the United States, R. prowazekii is endemic in flying squirrels. This form is zoonotic; sporadic human cases have been seen in Georgia, Virginia, West Virginia, North Carolina, Tennessee, Indiana, Illinois, Ohio, Pennsylvania, Maryland, Massachusetts, New Jersey, New York and California. Transmission of epidemic typhus occurs by arthropod vectors. The primary vector in person–to–person transmission is the human body louse (Pediculus humanus corporis). Lice become infected when they feed on the blood of infected patients; the lice defecate when they feed on a new host, excreting R. prowazekii in the feces. Transmission occurs when organisms in the louse feces or crushed lice are rubbed into the bite wound or other breaks in the skin. The rickettsia are also infectious by inhalation or contact with the mucous membranes of the mouth and eyes. In most parts of the world, humans are the only reservoir host for R. prowazekii. Infections can become latent and later recrudesce; humans with recrudescent typhus are capable of infecting lice and spreading the disease. In the United States, flying squirrels also serve as a reservoir host. Infections are spread between squirrels by squirrel lice (Neohaematopinus scuiropteri), particularly during the winter when populations are concentrated in nests. N. scuiropteri does not feed on humans but squirrel fleas (Orchopeas howardi) and other mammalian fleas are susceptible and may be important in spreading the disease to humans. Inhalation of organisms in infected louse feces or contact with squirrels may also be routes of transmission. Lice infected with R. prowazekii excrete organisms in the feces after 2 to 6 days and die prematurely, within 2 weeks. Bacteria can survive in the feces and the dead lice for weeks. R. prowazekii is susceptible to 1% sodium hypochlorite, 70% ethanol, glutaraldehyde and formaldehyde. It can also be inactivated by moist heat (121° C for a minimum of 15 min) and dry heat (160–170° C for a minimum of an hour). The incubation period is 1 to 2 weeks; most infections become evident after 12 days. years later; this form is called Brill–Zinsser disease. Recrudescent typhus is usually mild, with lower mortality rates. The symptoms of the zoonotic form resemble classic typhus but are almost always mild. The fever usually lasts for 7 to 10 days and the rash is often barely visible or absent. R. prowazekii is not transmitted from person to person. Patients can infect lice while the fever is present and may continue to be infectious for another 2 to 3 days. Patients with Brill–Zinsser disease are also infectious for lice. Epidemic typhus is usually diagnosed by serology; a fourfold rise in titer is diagnostic. Titers usually become detectable during the second week. Serologic tests include the indirect fluorescence antibody test, latex agglutination, complement fixation, enzyme immunoassay (EIA) and the toxin–neutralization test. R. prowazekii may cross–react with R. typhi (the agent of murine typhus) in some tests. Organisms can also be identified in tissue samples, including skin biopsies, by immunohistochemical staining. Polymerase chain reaction (PCR) assays may be available in some laboratories. Isolation and identification of R. prowazekii is not widely available or used for diagnosis, as rickettsia are both fastidious and dangerous to laboratory personnel. Early treatment with antibiotics is effective and relapses are uncommon. Treatment is sometimes begun before laboratory confirmation, particularly when the symptoms are severe. Antibiotics can also speed recovery in patients with zoonotic form. No commercial vaccines have been licensed, but experimental vaccines are produced by military sources in the United States and may be available for high–risk situations. Residual insecticide treatment of the clothing and hair is recommended for people who may have been exposed to infected lice. Epidemics of typhus usually occur where louse populations are high. Infections are typically seen in populations living in unsanitary, crowded conditions; outbreaks are often associated with wars, famines, floods and other disasters. Most epidemics occur during the colder months. Sporadic cases of zoonotic typhus are seen in the United States. The overall case fatality rate for untreated infections is 10 to 40%; the mortality rate increases with age. Infections are rarely fatal in children less than 10 years old; in people over 50 years old, the mortality rate can be as high as 60% without treatment. Deaths have not been seen in the zoonotic form, regardless of treatment. In the United States, R. prowazekii is endemic in flying squirrels (Glaucomys volans). Infections can be transmitted to humans from this species but little has been published about the disease in squirrels. Dogs have been experimentally infected but seroconverted with no clinical signs; no organisms were recovered from the blood. Azad A.F. and C.B. Beard. “Rickettsial pathogens and their arthropod vectors. ” Emerging Infectious Diseases 4, no. 2 (Apr–Jun 1998). 4 Dec 2002 . Breitschwerdt E.B., B.C. Hegarty, M. G. Davidson and N.S.A. Szabados. “Evaluation of the pathogenic potential of Rickettsia canada and Rickettsia prowazekii organisms in dogs.” J. Am. Vet. Med. Assoc. 207, no. 1 (Jul 1995):58–63. “Epidemic typhus.” In The Merck Manual, 17th ed. Edited by M.H. Beers and R. Berkow. Whitehouse Station, NJ: Merck and Co., 1999. 4 Dec 2002 . “Epidemic typhus associated with flying squirrels –– United States. ” Morbidity and Mortality Weekly Report 31, no. 41 (Oct 22, 1982): 555–6;561. 4 Dec 2002 . Huffman J. and V. Nettles. “Typhus and flying squirrels.” Southeastern Cooperative Wildlife Disease Study (SCWDS) Briefs, October 1999, 15.3. 3 December 2002 www.uga.edu/scwds/topic_index/1999/ TyphusandFlyingSquirrels.pdf>. “Material Safety Data Sheet – Rickettsia prowazekii.” January 2001 Canadian Laboratory Centre for Disease Control. 4 Dec 2002 . “Surveillance and reporting guidelines for typhus. ” Washington State Department of Health, Oct 2002.4 December 2002 http://www.doh.wa.gov/notify/ guidelines/typhus.htm>. “Typhus Fevers.” Centers for Disease Control and Prevention, Feb 2002. 4 December 2002 . Churchill Livingstone, 1996. 4 Dec 2002 . During the toddler years, your child will make huge strides physically, intellectually, and emotionally, whether it's learning to use the potty or how to make friends. Here's a look at what's to come. Once your child's a confident walker, he'll discover the joy of dragging or pushing toys along. And all the while he'll improve his coordination, since he'll be walking forward while occasionally looking back. So offer him some pull or push toys to play with, or make your own by attaching a string to a toy car (make sure to supervise or limit the length of the cord to 12 inches to avoid a strangulation hazard). Let her practice. Line up a few small toys on the floor and have a "treasure hunt," where she has to go from one item to the next and pick them up - a perfect activity for cleanup time! Provide safe opportunities for climbing. Toss sofa cushions or pillows on a carpeted floor, or let him loose at a toddler-friendly playground. Anchor bookcases and other pieces of furniture to the wall, even if you think they're too heavy to topple. Clear shelves of things that could fall on him - or that could tempt him to climb. Limit access. Keep chair seats pushed under the table, and take a closer look at the stove: Could your child get to it by climbing up shelves or cabinets? Set up gates at the top and bottom of the stairs. It's the only way to keep your child from attempting that irresistible - but dangerous - ascent. To help your child learn to climb the stairs safely, practice together by taking him up and down while holding his hand. Play tag where falling won't hurt too much, such as on a grassy lawn or a sandy beach. Chase your child - this is one time you can actually encourage him to run away from you! - and then switch and have him run after you. Try racing, especially if older kids are willing to play along. Your child peers down at her diapers, grabs them, or tries to pull them off when they're soiled; or she squats or crosses her legs when she needs to go. These actions show that she's mature enough to understand how her body works. She shows an interest in things that are potty-related - wanting to watch you go to the bathroom or talking about pee-pee or poo-poo. If these apply to your child, and she can get on and off the toilet and pull her pants down, then give toilet training a shot. Help her associate the about-to-go sensation with using the potty. As soon as you notice the usual signs, give a quick prompt like "Let's use the potty" as you guide her toward it. For more tips and strategies, check out our Potty Training guide. Go curb hopping. Holding your child's hand, stand next to her on a curb or a low step and say, "One, two, three, jump!" then jump down simultaneously. Practice leapfrogging as a prelude to jumping from a standing position, which is more difficult than hopping off a step. Show your child how to get down into a half-squat position and throw her arms up while she hops. Gradually she'll figure out how to jump from a standstill. How books work - we open them, the story is inside. We read from left to right. Books can tell a story. Stories have a beginning and an end. Let your baby play with his books so he gets familiar with them. Keep it brief. Little people have little attention spans, and ten minutes - even five minutes - is a long time. Ask questions. Have him find simple things, like the baby's eyes or the pretty flower. Your goal is to bring what's happening on the page into an interaction between the two of you. Follow your child's lead. If your tot grabs the book from you to explore it on his own, let him - just hold him on your lap and cuddle with him as he looks. Allow more time in your schedule for her to do things herself. If she wants to put on her own coat, shoes, etc., getting out of the house will take that much longer. Include her in your chores. Let her hold the dustpan, or send her around with a rag to dust furniture legs. Be patient. At first, letting your child use a fork or pull on his pants will drive you crazy. But let her try and don't step in. Say yes to your little naysayer whenever you can - in other words, when it isn't unsafe, inconvenient, or unreasonable. Be firm when necessary. When you have to get your way, do it as quickly, deliberately, and calmly as you can. Once you've physically put your toddler in her car seat, you can explain your reasoning in simple terms - you can tell her that it's dangerous to ride in a car without one. Don't finish your toddler's sentences for him; doing so will only add to his frustration. Remember that he'll still resort to crying when he's too tired, hungry, cranky, or overwhelmed to use words. Give your child lots of opportunities to speak, especially if there are older kids in the house, too. As your toddler becomes more verbal, make sure you model good speech rather than correct his pronunciation or his grammar. Children who are interrupted and corrected can feel like giving up. Don't try to fix it when he feels bad. Help your child learn to cope by identifying his emotions for him - whether he's sad because his favorite toy broke or someone else is crying - and reassure him that it's okay to feel the way he does. Watch your own emotions. Don't be shy about telling your child when you're angry, sad, or disappointed - but make sure that you're not overreacting to the situation, which can make your child feel anxious or scared. Acknowledge her feelings. If she can't tell you what's bugging her, see if she can show you. Rather than seeing it as good or bad, see it as a signal. When a child regresses, she's usually telling you that she needs comfort. Let her snuggle up with you, or read her a book. She'll likely behave like her normal self soon. You might worry if your child is delayed in reaching a milestone. But some kids are simply late bloomers; some just master certain skills before others. However, if you're concerned, speak to your doctor. For more information, go to our Motor Skill Delays guides. A toddler is constantly learning how to do new things. Give yours loving support, and as often as possible provide a little freedom for him to strive for independence. And don't worry if he occasionally "unlearns" a skill - a little regression is just part of the process in the toddler years.